My MissG has similar challenges, but she loves balloons. This has made birthday parties hard for her whole life though. Party games are awful for her. Large groups of excited children are fun and completely overwhelming at the same time. 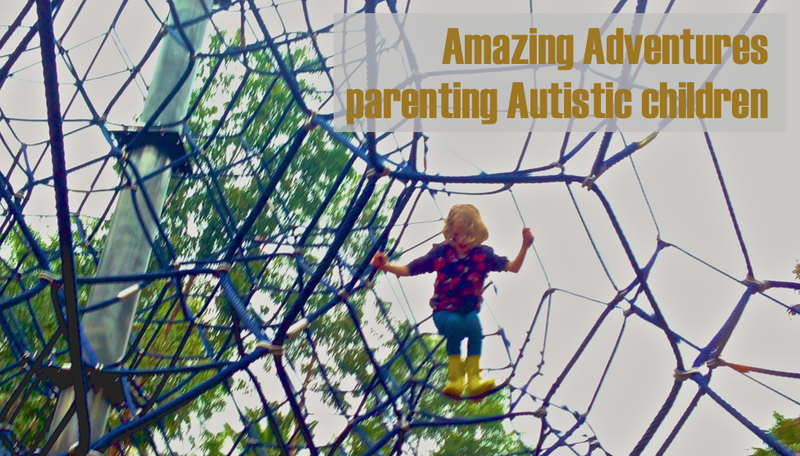 MissG is Autistic, but Autistic children are not the only ones who can have sensory challenges. As many as one in twenty kids are believed to have "Sensory Processing Disorders" in Australia. The little ones who cover their ears and cry when a balloon pops (this was me.... still is me....) could very well be some of them. The kids who hide in a corner after half an hour and just want to play by themselves could be some of them too. Although MissG finds parties hard she still loves them, being the social person she is, and she wants to have her own party each year. 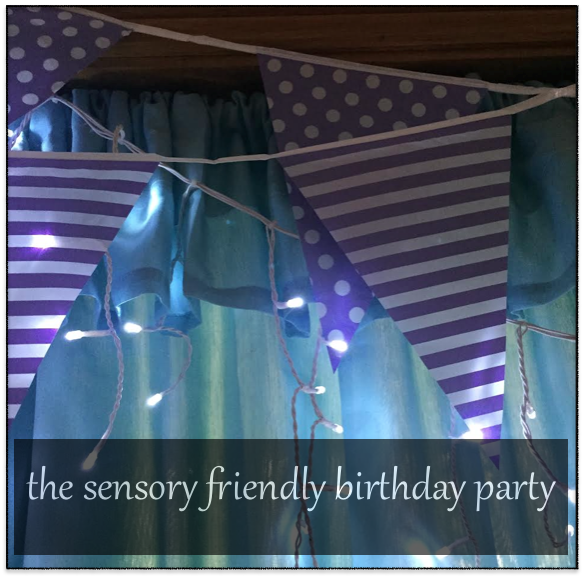 In the past I have tried to give her a party that mimics the "normal" birthday party experience, because she has wanted to have games and lots of friends over, and the whole shebang. This has meant that I have spent most of the party at her side, supporting her back from the brink of meltdown after meltdown. It is so hard for her. During the past 12 months something new has been happening for MissG around meltdowns. She has started to feel embarrassed by her own meltdowns, especially when people outside her immediate family witness them. Having noticed this, I have become unwilling to put her in situations where she is guaranteed to have a meltdown. I know that as she gets older her tolerances will shift, and she will be able to do some of the things that she can't do now with out melting down. We will work on pushing boundaries and learning tolerances as she grows older and gains skills. For now though, so that MissG can have a birthday party she enjoys without experiencing embarrassment, I decided to take a different approach. We did almost nothing in the way a "normal" birthday party would. We had no set schedule. We had no party games. We had no loud music. We had only 2 guests. We kept it short (2 hours was plenty of time). There were no surprises. MissG chose everything that was going to happen from a set of options I provided her, she saw everything before the party and helped set everything up. Every activity had a sensory purpose for MissG. All the activities were set up for the whole party at our large dining table, so everyone shared space but could move to a defined section of that space if they needed to. Nothing was cleaned up along the way. It was more like a "play date" with birthday cake than a birthday party. And it was perfect for MissG. We had 5 activities, each chosen because MissG likes them. Drawing and colouring in are relaxing for her, play dough and juggling balls (or stress balls, thinking putty and other similar things) provide an opportunity for stress release as they are squished and manipulated, blowing up balloons and blowing bubbles are good for stress release, the bubbles are just pretty and fun, the little puzzles were bought to fit in with the mermaid theme and for a simple fun game and the small spinning tops are excellent spinny stimmy goodness for anyone!! Birthday cake time was approached sensitively. 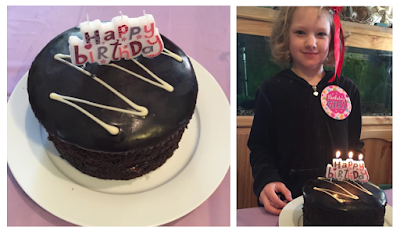 The cake was chosen by MissG, to her exact specifications... a double layer chocolate cake with chocolate icing and jam in the middle. She helped assemble it and placed the candle on top. We had the cake early on in the party, so that it was not something waiting to happen that could cause stress. MissG lit her own candles. I asked if she wanted us to sing to her, and I asked if she wanted us to "hip hip hooray" for her. She blew out the candles, and went back to playing. Hunger can be a sensory trigger, so I made sure there was food available during the whole party. MissG chose the food she would like to have, so there were no surprises there either and I knew she would enjoy anything offered. This party was no more difficult to organise than any other party we've had for any of our kids. It was quiet and simple. MissG enjoyed herself, it was her first meltdown free birthday party, and she had energy and coping skills left over afterward to make a trip to the shops to make a purchase with money she was given for her birthday. Win! 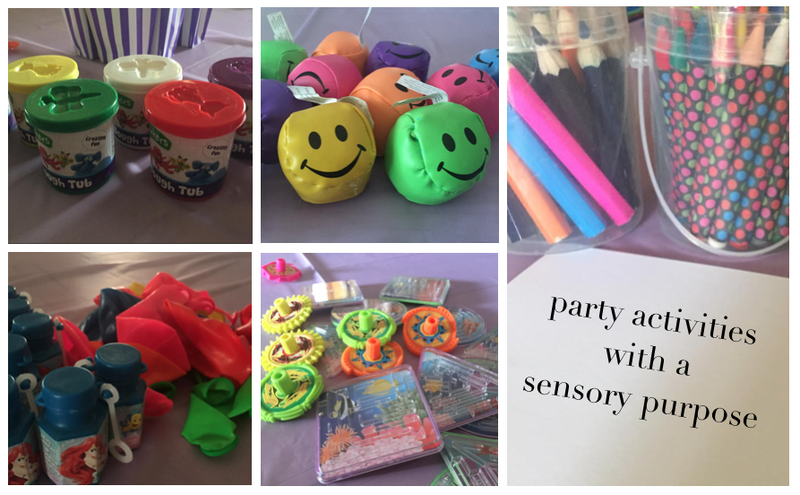 Today, when I asked MissG about her party she said "I had a really fun time" and then instructed me to put it on the blog! 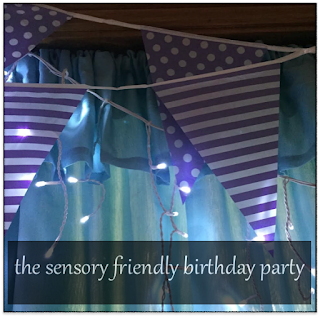 So, there you go, with MissG's approval- her sensory friendly birthday party. We realized pretty early on our parties would look different, too. The important thing is to have a "party" -- HOWEVER that looks for your family!